Net Weight: 30 ml., 60 ml., and 120 ml. There are two variants of Lacto Calamine Skin Balance Daily Nourishing Lotion available in the market. One is ‘Oil Control – for oily to normal skin’ that comes with ‘Kaolin + Glycerin’, and another is ‘Hydration – for dry to normal skin’, which contains ‘Kaolin + Aloe Vera’. Oil Control – For Oily To Normal Skin: Aqua, Light Kaolin, Castor Oil, Glycerin, Zinc Oxide, Zinc Carbonate, Emulsifiers, Preservatives, Perfumes, and Permitted Colours. Hydration – For Dry To Normal Skin: Aqua, Light Kaolin, Sorbitol Solution 70%, Propylene Glycol, Glycerin, Aloe Vera Gel, Castor Oil, Zinc Oxide, Zinc Carbonate, Simethicone, Emulsifiers, Preservatives, Perfumes, and Permitted Colours. 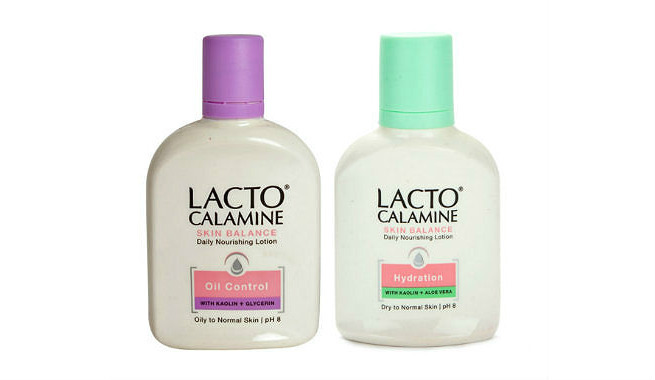 Both variants of the Lacto Calamine Skin Balance Daily Nourishing Lotion have almost similar packaging. However, you can distinguish the variants from one another by the color of their caps and labels. The oil control is purple in color while the hydration is soothing green. The lotion comes in a simple white plastic bottle that is slightly flat and rectangular in shape. It is a lightweight yet sturdy bottle with a pretty wide mouth, which is covered with a big and tight screw cap. You can get all necessary information about the product from its label printed around its body. The bottle is totally opaque and hence, it is not possible to easily keep an eye on the product left inside. Moreover, the wide open mouth makes it extremely difficult to pour only the required amount of product during each application. In short, the packaging is quite unhygienic for regular use. However, the availability in three different sizes makes it an easy to carry product. In fact, the smallest bottle slips into a small purse without any hassle. The lotion itself is a liquid of medium consistency (not very thin or runny though) with slightly uneven texture. It has a light pink tint and a medicinal smell. Though the smell vanishes after use, it might irritate sensitive noses to some extent. The product is intended only for external use and the bottle needs to be shaken well before each use. “Daily nourishing lotion for oil control (or hydration) and maintaining skin vitality with the goodness of kaolin and glycerin (or aloe vera). Zinc oxide with antiseptic properties helps protect skin from acne breakouts and helps reduce dark spots and blemishes. Being a combination of skin-enriching elements, Lacto Calamine Skin Balance Daily Nourishing Lotion works as a true bliss for our skin. Kaolin is the major ingredient that maintains the natural moisture level of the skin, controls excess oil secretion, and facilitates the absorption of all other ingredients. Zinc oxide provides sun protection, treats sunburns, delays aging, heals wounds, and cures a number of skin ailments. Zinc carbonate is a great astringent that makes pores less visible while maintaining oil balance in the skin. The antibacterial and anti-inflammatory properties of castor oil make the lotion comedogenic, which helps in fighting against acne, breakouts, etc. The glycerin and castor oil in the lotion provide ultimate nourishment to the skin, keeps it soft and moisturized, and turns it youthful. Glycerin also helps in preventing blackheads as well as lightening the skin tone upon regular use. Aloe vera offers great hydration to the skin to keep it soft and supple for a long time. The lotion gets absorbed into the skin quickly without leaving any oily residue. It not only creates a matte finish but also prevents greasiness up to 5-6 hours so that you can look absolutely fresh. It is often recommended by dermatologists to heal summer rashes, allergies, and other mild skin conditions. However, this is not a super hydrating lotion and hence, you might need to rely on a more powerful moisturizer during winter. It is also not much helpful in fading away pigmentation marks, blemishes, and the marks and spots left by acne and pimples. Apply twice daily – in the morning and at night – after washing your face thoroughly. For best results, apply every day with Lacto Calamine Deep Cleansing Face Wash.
Soothes and cures allergies, infections, itchiness, irritation, insect bites, etc. Might not be suitable for using in winter. Doesn’t fade away marks, spots, and blemishes. Verdict: Lacto Calamine Skin Balance Daily Nourishing Lotion is a perfect moisturizing product for everyday use unless and until you have a super dry or super oily skin with tons of marks and spots.